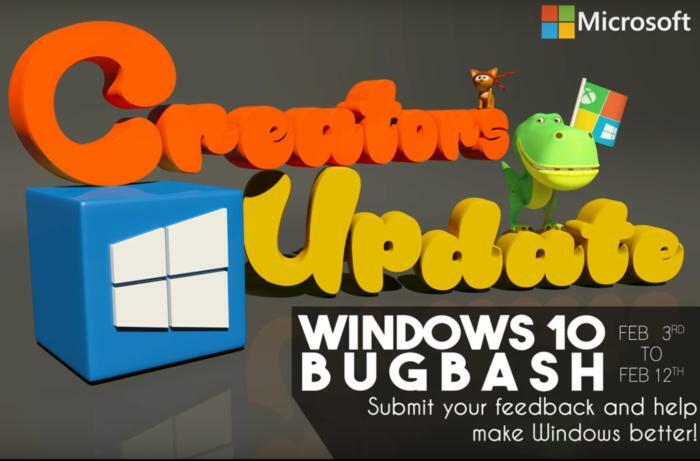 On Friday, Microsoft announced the launch of its “bug bash” for the Windows 10 Creators Update, a sign that it’s beginning to slowly wind down its development process before it finally releases the next major version of Windows. Historically, Microsoft begins each iteration of its milestone Windows 10 releases by fixing a few last-minute bugs from the previous version. It then begins rolling out and testing all the new features of the upcoming milestone to Windows Insiders in the preview program. At some point, though, Microsoft moves into the last phase of its development process, fixing all of the bugs that Microsoft employees and its Windows Insider beta testers discover in the imminent release. That phase typically begins with a huge bug-fixing exercise, known as the “bug bash,” whose current iteration will run through Feb. 11. Microsoft uses the information it gathers to determine which bugs are the most serious and prevalent, prioritizing them. Microsoft hasn’t said when the Creators Update will actually ship; it’s still due in “early 2017.” The blog post announcing the bug bash notes that Microsoft developers will be working on fixing these bugs for the next “several weeks,” however, meaning that our guess that the Creators Update could be released at the end of March is still valid. Why this matters: Most users know on some level that adding a new software feature introduces new bugs to go along with it. The annual bug bash/bug-fixing phase is critical, however, to help shape the public’s opinion. Not every bug will be found or eliminated before the software’s release. The idea is to at least prevent headline-grabbing glitches such as those that disabled webcams in the Anniversary Update. Any motivation to assist Microsoft in its bug bash is primarily a charitable one, with the end goal of simply improving Windows. 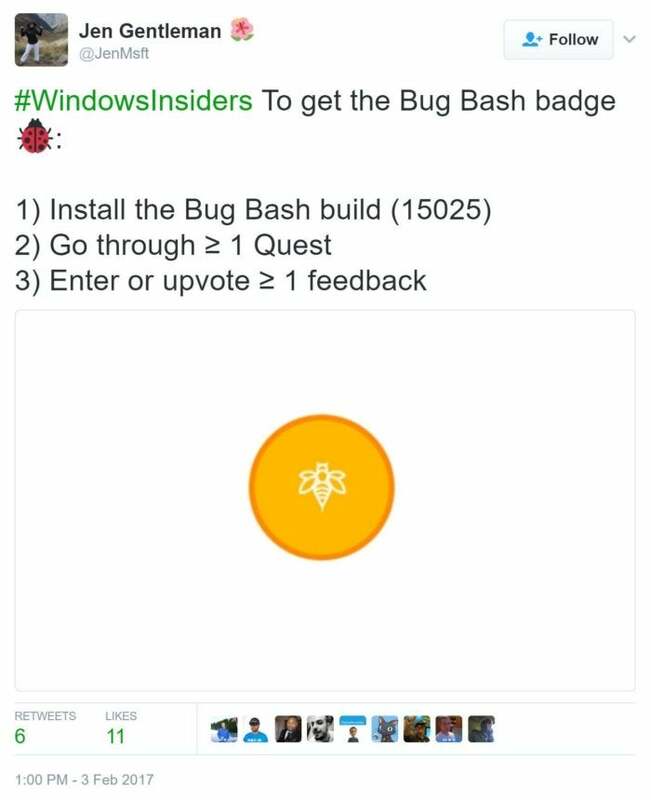 Nevertheless, Microsoft is offering special Bug Bash badges for the Feedback Hub as prizes for those that participate. Insiders need to check the Windows 10 Feedback Hub for new “Quests,” tasks that Microsoft would like beta testers to perform to check for bugs. Leaving feedback within the Hub is also encouraged. You’ll need to make sure that you’re running the latest Windows 10 preview, Insider Build 15025, which includes a consolidated feedback mechanism so that similar reports are consolidated into a single response. Microsoft will also hold live webcasts with engineers from 2 through 4 P.M. PT on Feb. 7, and from 7 through 9 P.M. on Feb. 7, to walk users through some of the quests. Those quests will change over the course of the week, Microsoft said. As always, we recommend that Insiders test out Windows 10 on a secondary PC, one that you don’t do anything truly important on. Stumbling across glitches or bugs that can break or force you to reset your PC is part of the Insider experience. Cruising on an Insider machine, though, can also be an awful lot of fun.